Weather station maintenance is very important for gathering accurate weather data, but it is just as important to make sure your well-maintained instrument is properly placed without any shade throughout the day. NEWA apple carbohydrate thinning and apple irrigation models are heavily dependent on solar radiation data from fully exposed sensors. A weather station that reports erroneously low solar radiation will result in carbohydrate thinning model outputs suggesting the trees are under stress and no chemical thinning is needed. In reality, the user might miss an important thinning window or badly under-thin. If the readings are too high, the model would erroneously suggest a strong thinner concentration, leading to over-thinning. This is so important that NEWA-linked weather stations reporting data outside of a normal expected range are deactivated in these specific cases to prevent misinterpretation of the apple crop management models. Erroneous radiation data generally is due to either the sensor drifting its calibration or shade for some time during the day from a building or trees. Shading is often the culprit when a weather station consistently reports low solar radiation. In some cases, the weather station owner has not removed the factory-installed “green cap.” Very low readings are reported on bright sunny days while no reading or zero values are reported on cloudy days. Other times, a weather station is inadvertently placed near a building or tree. Full solar radiation exposure is maintained for most of a day but drops to zero when the instrument becomes shaded by a structure or object. 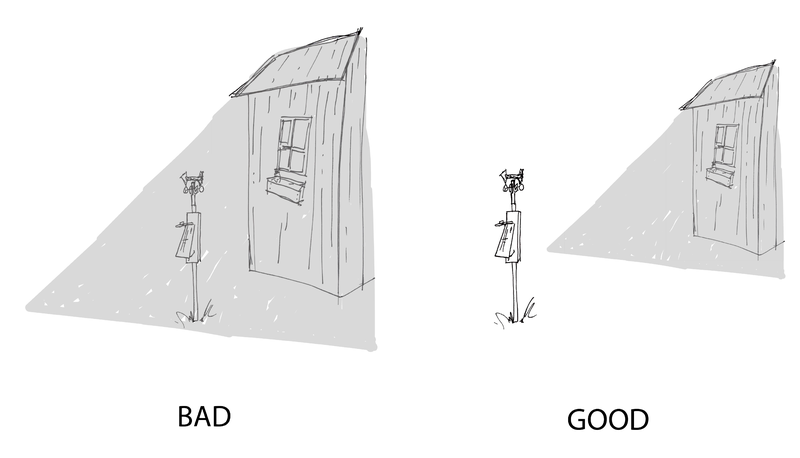 Shade will not affect temperature readings as much as solar radiation. The instrument thermometer is artificially shaded, to begin with so additional structural shade will not have a large impact. But the solar radiation sensor is meant to receive full exposure from sunrise to sunset. Weather station siting is much more critical for radiation-driven models like carbohydrate thinning and the apple irrigation models than for temperature-driven models. Check for shading several times from sunrise to sunset the next time you have a bright sunny day. If you are unable to access the carbohydrate thinning or apple irrigation model from an otherwise functioning weather station, shading may be the culprit. If you get low readings even with full exposure then the sensor is bad and needs replacement or re-calibration. Contact the NEWA Help Desk at support@newa.zendesk.comfor assistance with replacing a bad solar radiation sensor. Special thanks to Dr. Alan Lakso, Professor Emeritus, Cornell University for contributions to this article. This entry was posted in information, weather stations and tagged carbohydrate thinning model, exposure, irrigation model, shading, solar radiation, weather station placement on May 21, 2018 by Dan Olmstead. New York State IPM Program staff members Tim Weigle and Dan Olmstead got together and gave a 1-hour webinar for the Northern Grapes Project on 10 April 2018. Dan provided a 20-minute boot camp on NEWA basics including history, navigation, general tool categories, and future directions. Tim gave in-depth 40-minute that covered NEWA grape disease and insect risk assessment tools. These included phomopsis, powdery mildew, black rot, downy mildew (DMCast), powdery mildew, and grape berry moth. Tim Weigle is the Statewide Grapes IPM Specialist at NYS IPM and is located in Portland, NY with the Lake Erie Regional Grape Program. Dan Olmstead is the NEWA Coordinator at NYS IPM and is located in Geneva, NY on the Cornell AgriTech NYSAES campus. Learn more about the Northern Grapes Project by clicking here. This entry was posted in about models, black rot, downy mildew, Events, grapes, news, phomopsis cane and leaf spot, powdery mildew and tagged grape diseases, NEWA, Northern Grapes Project, risk assessment on May 7, 2018 by Dan Olmstead.